The 7th and 8th grade just finished their Reading Unit on the novel “The One and Only Ivan” by Katherine Applegate. Ms. Kneifl won the books in a contest sponsored by The Teaching Bank. Students wrote a short summary, some facts that they learned about the real Ivan the gorilla and gorillas in the wild, as well as their favorite part of the book. The novel is fiction, but the true story about the real Ivan is very heartwarming. Ivan was a Western Lowland gorilla that was captured in the Congo as a baby and brought to the U.S. to be kept as a pet. He was raised as a human and when he got too big for humans to handle he was held at the B&I Shopping Center in Tacoma, Washington, where he lived for 27 years, before being moved to Zoo Atlanta. Ivan died at Zoo Atlanta at the age of 50 years old. 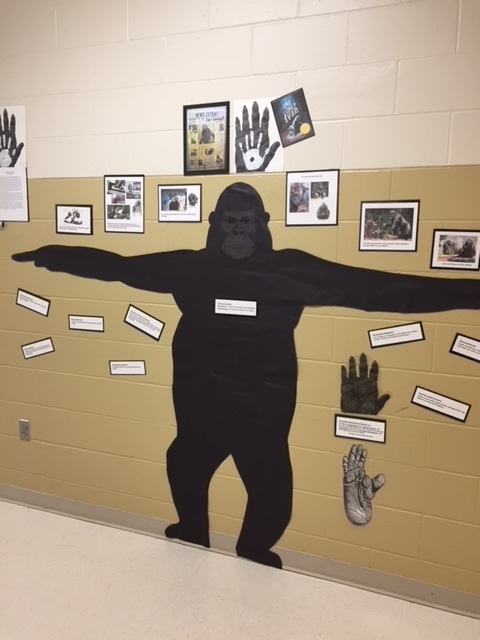 The students learned about primates and finished the unit with a viewing of the National Geographic special “The Urban Gorilla” which featured Ivan and a display on the hallway wall where students can learn fun facts and compare their hands, feet, height and arm length to a life-sized gorilla.